Click on the photo and see all the photos of Luxury Infinitum. 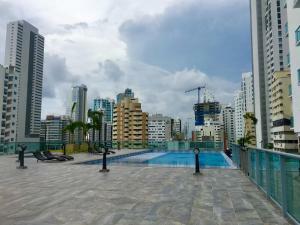 Featuring an outdoor swimming pool, Luxury Infinitum is located in the Bocagrande district of Cartagena de Indias, only 3.4 km from Bolivar Park. Situated 3.4 km from Cartagena's Gold Museum, the property provides a terrace. This apartment features 3 bedrooms, a living room and a fully equipped kitchen. The air-conditioned apartment also offers 3 bathrooms with a bath. Palace of the Inquisition is 3.4 km from the apartment, while San Felipe de Barajas Castle is 3.8 km away. The nearest airport is Rafael Núñez International Airport, 8 km from Luxury Infinitum. This property will not accommodate hen, stag or similar parties. A damage deposit of COP 500000 is required on arrival. This will be collected as a cash payment. You should be reimbursed on check-out. Your deposit will be refunded in full in cash, subject to an inspection of the property.